Title: "Scratch Beginnings: Me, $25, and the Search for the American Dream". Publication: Collins, ISBN 0-06-171436-8, 2009. 221 pages, hardcover. Adam Shepard told John Stossel on ABC 20-20 that he was assigned Barbara Ehrenreich’s “Nickel and Dimed” in English or perhaps Sociology class at Merrimack College in Massachusetts. He got educated away from his North Carolina upbringing, and decided to return to his roots, to some random city, that turns out to be Charleston, S.C., to see if he could challenge what he thought was Ehrenreich’s negativity about starting out in the minimum wage job market. He gets off a train on a hot July night and winds his way to the Crisis Ministries Men’s Shelter. He quickly settled in to the quasi-regimented and scrappy life (there were chores, and a required TB test), and the exploitative Easy Labor company that hired the homeless as day laborers and rather ripped them off. He sold his blood (plasma) repeatedly for a while for income (many poor people do). But he soon found his way to a moving outfit called Fast Company. Household moving is hard work, and he was most fit to do it. He quickly made crew chief and soon could afford an apartment and used car. He did take on a roommate (which Ehrenreich wouldn’t do). Shepard passed his self-imposed rite of passage (or call it a journalism project, which rather reminds me of ABC’s hiring undercover workers to work at Food Lion in the 1990s) because he was physically fit (very much so, despite what he says is an genetically unimpressive beard) and has great social skills – call it Donald Trump’s “street smarts” as well as “book smarts”. Yes, he would make it as The Apprentice, probably. He did, as he says, come from a good family, and now must return the favor and stay near ailing parents in North Carolina. Most of the homeless, it seems, do have some major personality or social adaptation problems. His own account makes it seem that way. The writing in this book is crisp and his images move quickly. In his Epilogue he provides a "didactic" look at the experience (again, "didactics" was one of my father's favorite words, like "deportment", from the early 20th Century) and makes some "policy" suggestions, that people should reach out more and mentor more. That sounds great if you're starting out in adult life. The dust jacket says that this is his first book, so maybe he does plan on political journalism. It strikes me that he has the right aptitude for the military (he manages to imply that he is straight when talking about the blood plasma experience – although it’s a shame if that matters much longer, as in my previous post). I would think that the US Army would sign him up for OCS and language school tomorrow if he wanted to go. We need all the help we can get in military intelligence in unusual languages. I wonder if he has thought about that. 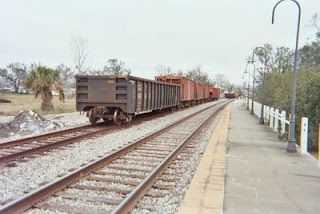 Picture (mine): Gulf coast railroad tracks (in Mississippi), Feb. 2006. Here is Stacey Cochran's YouTube interview with Shepard. The book was originally self-published before being agented and picked up by Harper Collins.